The upper panel of this vase depicts the shepherd Endymion luring Selene the Moon down from the sky with a shining fleece. 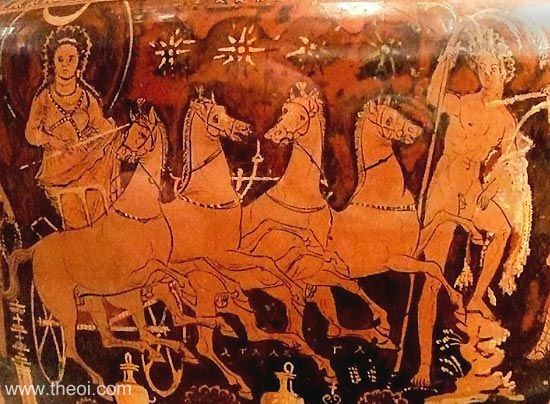 The goddess drives in a four-horse chariot and is crowned with the crescent moon and shining aureole. Aphrodite and Peitho, the goddesses of love and seduction, stand to her left (see other image). To her left (see other image) stand Aphrodite and Peitho, the goddesses of love and seduction. The lower panel depicts Heracles' quest for the golden apples of the Hesperides. The figures, from left to right, are Hermes, Heracles, Atlas (see other image), Gaea and one of the Hesperides standing before the serpent-entwined tree. Only the figures of Atlas, Ge, Aphrodite and Selana are labelled on the vase.